A few months back Google Added Revision History for Google Documents and today Google announced revision history is now available in Google Spreadsheets as well. After playing with the new feature, I have to admit they did a fabulous job. Changes made by collaborators are grouped together in batches and color coded. 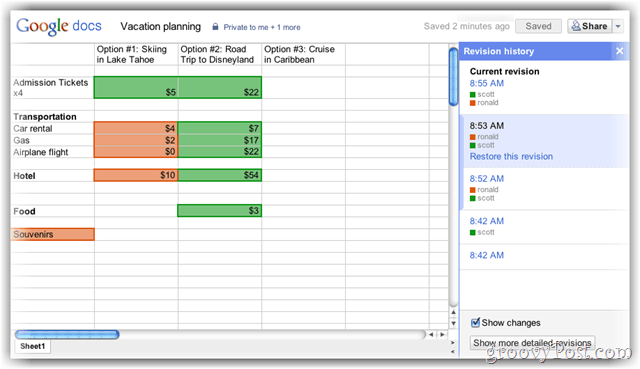 You can review the revisions easily cell-by-cell. For people like me, this is a big deal since I collaborate in Google Spreadsheets all day to manage the workflow for articles up here on groovyPost. Very groovy indeed!